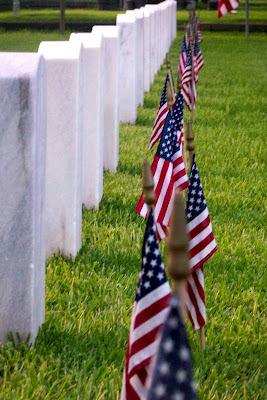 As is our habit, near sunset, we went to the national cemetery in our city and I began to contemplate this day of "remembrance" in our nation. Recently I have been reading the book, "You'll Be Sor-ree!" by a delightful gentleman in our area, Sidney Phillips. It is the story of his experience as a young Marine serving at Guadalcanal. Having met Dr. Phillips a few months ago, I wanted to read his book as soon as I saw it on the shelf at the library. He does a great job of describing the extreme circumstances he encountered. While I realize he has tempered the experiences a great deal, he succeeded in showing us glimpses of the horrific reality of war. 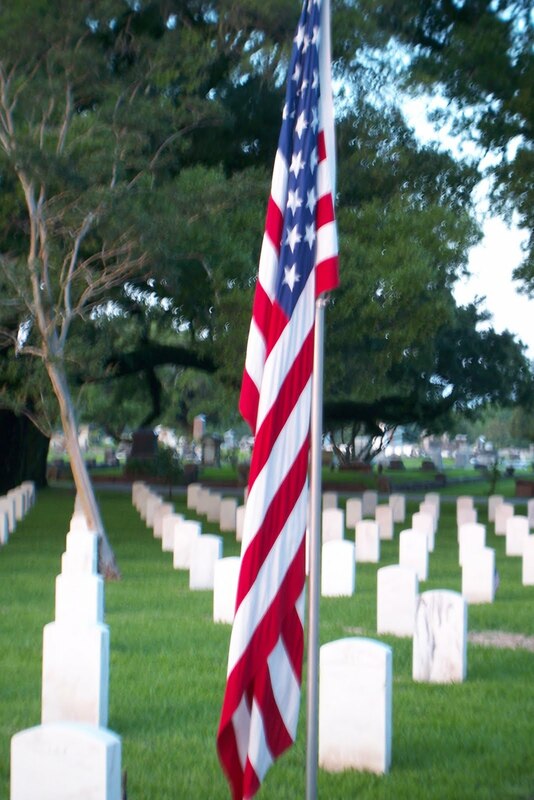 With this in mind, I thought of what Memorial Day must mean for those who have served in war time. On this day when we are all trying to hard to remember, how much must they be trying to forget, perhaps not only this day, but every day. What sights, sounds and feelings must rise to the surface that have been pushed so far down out of memory. It gives even more reason for each of us to take a moment each time we encounter military personnel, shake their hand and thank them whole-heartedly for their service to our country and to us. and especially to my son. . .you have my most sincere thanks. If By One Man. . .
Now surrounded in Boston by other structures, the Old North Church seems somewhat insignificant compared to newer or larger architecture nearby. As I stood and craned my neck to look upward at the steeple of the Old North Church, I wondered how one man's actions could have such an effect on the people around him, the people who would come after him, the history of a nation, indeed, the history of the world. 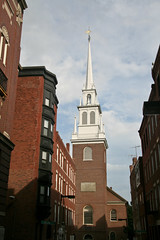 If Paul Revere had not given the signal to put two lanterns in the steeple of the Old North Church, our nation might not have come to be. If America had never been born, what might have happened to the European nations during World War I and World War II? Would Iraqi women today have purple fingers because they have voted in their own elections? One man's actions. . .to have impacted the lives of so many. There are two other men whose lives and choices impacted so many. Through Adam sin came into the world (Romans 5:12) and through Jesus Christ "the gift by grace, which is by one man, Jesus Christ, hath abounded unto many" (Romans 5:15). We, too, must realize our lives, and our choices, affect and impact all those who come behind us. May our choices always be for Grace. Beyond the Bow. . . I never would have imagined it would be the end of May before we got back into our kayaks! This is not the latest start of the season we have had, but I certainly anticipated being in the water before now. An unseasonably cold winter (at least for us) and our vacation, set our first voyage of the season back a bit. 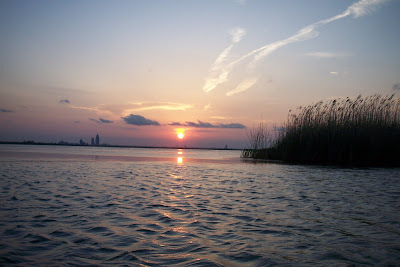 This was our twenty-fifth trip and the first sunset trip I believe we have ever had. We set off with what we hoped was plenty of time to have a nice paddle, see the sunset and then have enough light to load up the boats. We put in at Chacaloochee Bay and headed toward Conway Creek. We didn't exactly make it to the creek though, before it was time to head back. The sun appeared to be making its journey faster than we were ours. The sun setting on the water was beautiful and we kept looking back over our shoulder to watch it as it headed down to the horizon. We were pleased to see this season, the return of our friends the gators. We saw several, and several big ones, while we were out. After not seeing any toward the end of last season, it was nice to have them "welcome" us back again. One of the highlights of our trip to Boston was attending a Red Sox game. Except for the fact that it was 40° and the wind-chill made it feel like 20°, the game was a blast. was full and once the game was over I was expecting to encounter a long series of pushing and shoving as everyone in the stadium headed to the same subway station. I was so shocked as the crowd quietly and politely made its way to the station. Then, what I would have never expected to happen, did. All these hundreds of people all just filed into the station stairwell, one by one by one. Everyone was shoulder to shoulder, but no one pushed, no one shoved, no one tried to get in front of another one. The whole mass of people moved as one unit -- a river of souls -- toward the trains. It was an organized unorganized transit. I was amazed. There were no words, no shouts (except from people nearby trying to sell items). The whole transfer of the mass of humanity to the mass of transit was quick and orderly. Then it struck me. . .we were moving as one because we had the same goal, the same purpose, the same will. What a beautiful example of the body of Christ! All with one purpose, one will, one desire, working in unison to that one destination -- to glorify the Son and be conformed to His image. Traveling home from Boston and New York, our route took us through Virginia and Tennessee during the night. That particular night there was a continual rain. The drive through Virginia was miserable, not because of the rain, but because the lines on the road had almost worn away. Also, the reflectors that mark most interstates had worn down. In many spots along the road, there were no indicators of the lanes or the sides of the road. Twice while traveling through Virginia I had to exit the interstate. There was no way I could tell whether the gaping darkness I was driving into was actually the exit or if I was propelling our vehicle off the side of the road to our demise. Then we crossed the state line into Tennessee and the roads were a new creation. The lines along the sides were a bright yellow and white. Reflectors dotted the center lines at regular intervals and the road itself was as smooth as silk. It was a whole new world. We went from a driving experience of anxiety and frustration to one of enjoyment and pleasure. It was very reminiscent to me of the day, almost thirty-seven years ago, when I became a Christian. In a moment, in a flash, my life changed. I became "a new creature". My old life of sadness, emptiness and frustration was replaced with a life of fullness, joy and hope. The roads of darkness and uncertainty were replaced with roads that had a Guide and Teacher along the way. Never for one moment, have I regretted the change. Upon arriving in Boston, after driving through the night, we stopped at a diner to eat. Our waitress stepped up to our booth, and with the thickest Boston accent we were to hear during our stay, asked us if we would like anything. We began to give our order and she immediately replied, "Do I hear an accent here?" We just about rolled off our seats, because we were quite certain her accent was just as thickly Bostonian as ours was Southern. During the ensuing monologue, she told us we had to visit Faneuil Hall in Boston. Realizing that the best advice usually comes from the locals, we put this on our list of things to see. Imagine our surprise when we entered Faneuil Hall to find it basically a very large souvenir shop. I realize now, the name encompasses the whole area including Quincy Market, but at the time, I was greatly disappointed. As Christians, we receive advice throughout our lives from so many varied sources. These sources may be experts in their fields, but we should still wisely sort through all the advice to seek that which is from godly sources. We should seek to have that advice confirmed by other sources as well. The Lord has given us His word, His Spirit and the fellowship of other believers to help guide us through this world. It is our responsibility to "try the Spirits", to determine whether the advice and counsel we are receiving is truly from God or not. Prying My Hands Off the Wheel. . . While on our recent vacation, our route to Boston took us through Manhattan. It was my turn to drive. Thankfully it was about 9:30 at night, so the traffic was light. We had borrowed a GPS system from a friend at work. We nicknamed the British accented voice, "Daphne". Daphne told me almost every turn to make, taking me through what appeared to be a complicated and convoluted route by a series of twists and turns in the road. When we finally made it out of Manhattan, I felt as if I had to pry my hands off the steering wheel, I had gripped it that tightly. What would I have done without Daphne at my side to tell me to turn right or left? How would I have made all those turns and twists without her? How many times in my life have I come to a point where the road is convoluted and complicated where I couldn't tell which way I was supposed to turn? Without the guidance of the Lord in my life, how would I have known which way to go? How would I have possibly known the right way? Thankfully we have a Guide more sure than Daphne. Without power from the car, Daphne will "die". Eventually, without upgrades, her knowledge will be obsolete. Our Guide is eternal, everlasting and always perfect. point we took advantage of one of the many resting areas located through the city of Boston. We sat on benches and tables across from Paul Revere's house and feasted on goodies from a local pastry shop. As I looked up and down the street, I could easily see there was so much more to see and do than we could ever squeeze into our three days in this historical city. There were delightful looking Italian restaurants waiting for us on this street, pastry shops galore, historical sites we had not yet reached, and venues of culture and beauty that we would not begin to venture into. I wondered how long it would take for us to fully explore this town and exhaust all it had to offer. Would it be weeks, months, years? Could one ever fully know a city that was changing and growing even as you tried to explore its past? That, I believe, will be our marvelous experience of heaven. The more we try to delve into the glory that is our Lord, the wonder that is our God, the more we will find we do not know, the more we will find there is to know. We will ever be discovering more and more details of glory, more venues of beauty, more avenues of Grace. We will never be able to out-discover His majesty and abundance. We have just completed a whirlwind vacation to Boston and New York City. Our trip featured historical, cultural and entertainment venues. After visiting friends in Tennessee, we began our trip, unexpectedly, by visiting Stonewall Jackson's home and grave. Once in Boston we attended a baseball game at Fenway Park and watched the Red Sox beat the Toronto Blue Jays. The Blue Jays must have brought their Canadian weather with them because the temperature was in the 40s with a wind chill which felt like 20 degrees. We walked the Freedom Trail and saw our history come alive. We stood where early citizens debated unfair taxation, and saw the graves of John Hancock, Samuel Adams and Paul Revere. We saw the site of the first American public school. We stood outside the Old North Church. We attended the Boston Pops Symphony Orchestra with John Williams conducting and listened to music so beautiful it brought tears to our eyes. It was a magical evening in a magical symphony hall. We traveled to Plymouth, MA and visited Plymouth Rock, where my great, great, great. . .let's just say 13 generations ago, my ancestor Deacon John Doan came to Plymouth Colony. The quaint village and the personal significance made this a favorite among our visits. We wandered the streets of the North End of Boston, also known as Little Italy. We found the most wonderful Italian grocery and bought bread, cheese and olives. We enjoyed listening to the Italians banter their greetings back and forth. We visited Walden Pond. The pond was breathtaking in its simplicity and beauty. In New York we walked through Times Square with its flashing lights and colorful signs. We stood on the top of Rockefeller Center and looked down on a town wearing a mysterious shawl of fog. We marveled from above at the size of Central Park. We walked to Greenwich Village and participated in a Food Tasting Tour which presented us with different types of food and taught us historical and cultural facts of the area as well. This tour introduced us to a pastry shop with the best pastries I have ever put in my mouth. I am thrilled to know they ship. They will be making my birthday cake! We took the ferry to Liberty Island to visit Lady Liberty herself. We walked up her pedestal to view the city. We stood in awe of her size, her beauty and her perfect symbolism of freedom, liberty and the American spirit. We ended our trip by visiting the beautiful and haunting battle ground of Gettysburg. While in New York, we visited Central Park, which gave us the one truly negative, and one incredibly positive incident during the trip. I was sitting on a bench in the Park, Glen and the girls were dispersed nearby. An older gentleman came and sat on the bench with me. We didn't speak at first, which seems to be the mode of operation in New York. Glen came up to me and I showed him on my ipod Touch our exact location in the park. If you are not familiar with an ipod Touch, it is a small electronic device -- a hand-held computer -- about the size of a deck of cards which can do just about anything. This device contains all my appointments, my address book, my music, my Bible, and tools I use throughout the day to help me do the things I need to do. Showing Glen the map, prompted the gentleman to ask if we needed the map of the park he was using. Glen explained we had it there on the device. This started the conversation between us. Soon his wife walked up and joined us. Jerry, the gentleman, was a retired pastor. He and his wife Elaine, were visiting their grandson in New York. We had a wonderful chat and shared that bond that people have when they know the same Lord. Toward the end of our conversation, I reached into my purse to pull out one of Glen's cards to give Jerry and Elaine. In doing so, I either put my Touch in my lap, or set it on the bench without thinking. Either way, when we stood up to leave, my thoughts weren't on the Touch, they were on the people who had so just touched my heart. We separated from each other discussing how we knew we would "see each other again." It only took a few minutes for me to realize I had lost my Touch, but even in that short amount of time, someone had already picked it up. It was gone and I was distraught. All my information, all my tools were in that device. As is often the case when we deal with loss, it takes a moment for faith to catch up with grief. If I didn't know that the Lord orchestrates our steps, I would find it ironic that I had just been reading the chapter in A.W. Tozer's The Pursuit of God entitled, "The Blessedness of Possessing Nothing". Incidentally, I had been reading in on my Touch. I wiped the tears of disappointment from my eyes and in doing so dislodged my last contact. It fell down into the dirt of Central Park and remains there to this day. I knew that even though I had lost a thing, I had gained so much more. The encouragement, the love, the bond of Christ that had been shared with Jerry and Elaine were worth so much more to me than a thing. I came to realize that if I could do it all over again, and enter Central Park in a way that would allow me to avoid Jerry and Elaine, and to exit with my Touch still in my purse, that would not be my choice. I would do it just the same way. For years we had a sign on our wall that said, "God and people are eternal. Everything else is just stuff." I often wonder when I read quotes if the people who say those things live up to them. Now it is my choice, and I choose to. I am the author of that quote. I can choose to because I prefer the touch from the children of God we met, to the electronic Touch made by man. I know that one day I will enter the Kingdom of Heaven and at some point a gentleman with a sweet grin and a twinkle in his eye will walk up to me and say, "I told you I'd see you again!" I love driving on the interstate. It is almost like a game. A car passes you, then miles later, you end up passing the same car. You follow a truck and finally pass it, then when you least expect it, that truck passes you by. I love watching the ebb and flow of the traffic on the road and watching how all the cars and trucks fit together in a puzzle of rapid motion, all seeming to go where they want, if not when they want, without much incident or mayhem. We have a new "friend" along on our trip this time though that has dramatically changed how we relate to travel. One of the girls I work with loaned us her GPS for our recent trip (Bless you Tammye!) and we prompted nick-named the speaker with the British accent, "Daphne". Daphne tells us before it is time to turn, what turn we will be making, which direction we will turn and how many yards it will be before we do so. Her screen display tells us much more than that. If we don't follow Daphne's instructions and either by our own stubborn will, or our own stupidity, choose to make a wrong turn, Daphne takes that in stride. She doesn't yell, or get mad. She simply calculates a new route and tells us what is the best way for us to travel based on that new plan. Occasionally that means she tells us to "Turn around as soon as you can." Glen made the statement that it took the stress out of traveling because we knew Daphne wasn't going to let us get lost. "She'll tell us where to go!" It is so true, and it is true of the Lord as well. He leads us in our lives and "orders" our steps. We can follow His leading, or as with Daphne, we can stubbornly make our own choices and our own mistakes. When we do, He will work even those mistakes somehow into our good. Not that He plans our sins or determines our sins, but as a dear young Christian once said, "He just takes advantage of them." If we follow His plan and direction in our lives, we will reach the destination safely and securely in the time frame planned. If we make the wrong choices, our lives will be spent wasting time circling and retracing valuable steps. It is up to us. As for me, I think I'll listen to the Lord. Oh, and Daphne, too. I have begun working on a new quilt. The first quilt of this type I made was inspired by a quilt I saw in The Bombay Company. It was simply rows of straight, narrow strips of different fabrics quilted with straight black stitches. It was gorgeous beyond its simplicity. The quilt was made of all different types of fabric, some satin, some velvet; of many different rich colors. I fell in love with it immediately. Until, that is, I looked at the price tag. "$200? ", I'm quite sure I said this aloud in the store. "I can make this quilt myself for $20!" I told Glen. Then I set out immediately to do so. The result was a beautiful quilt that still drapes our bed to this day. Instead of batting, I quilted a lightweight blanket inside, so the weight and warmth it provides in the winter is very comforting. The next adventure of quilts of this nature turned into a "two at once" special. I began making a pretty yellow and white one for a good friend's new house. She had moved hundreds of miles away and I wanted her to have something bright and cheerful to remind her of the friends who so loved her at home. At the same time our son was deployed to Iraq and I started one to represent his team and to present to him upon his arrival home. Since that flurry of quilting activity, I haven't worked on a quilt. For five years, my quilting frame has been still. Once I purchased fabrics and even began cutting it into strips, but then life intruded and I put it all away. Last night I was sewing the different colored strips together. From my vantage point above the sewing machine, it looked as if everything was going according to plan. It wasn't until I ironed the quilt top that I realized the big mistake that had been made. While I was sewing one of the strips, the underside of the material had gotten caught up with what I was sewing. This caused a large piece of the quilt sewn to itself where it shouldn't have been. Immediately I thought of the verse, "There is a way that seemeth right unto a man, but the end thereof are the ways of death" (Proverbs 16:25). I thought my strips were sewing correctly, but instead I had made a big mistake that I had rip out and resew. Looking back on my life, how many times have I seen a path that I thought was "right" and it really was the way of death. We should be so careful to seek the will of the Lord in our lives and to seek the wise counsel of other Christians the Lord has placed in our lives. We will then save ourselves much time and sorrow from "ripping out" the mistakes and resewing the pieces.